You can read the other Conversation here! Bird: The seeds are all over the ground, not very appetizing!!! Bird: Well then, what are they good for? Bird: What is their purpose? Bird: You love us, right? Is that why you bought us seeds? Human: To feed you, and to have a chance to take your pictures! It's nice to have someone/thing to with whom to carry on a conversation...sometimes, I'm the only company I have. I love the photo. Sweet little bird, it looks happy to eat seeds from the ground. "Framed In By the Branches" is really cute! Oh no, no finger pointing in the conversation with these birds. Lol - great pics and very amusing words. Nice shots. I like the collage! Lovely collage. Fun post too. Very beautiful shot and nice words. Cute post and great shots of the Sparrow. Have a great weekend! 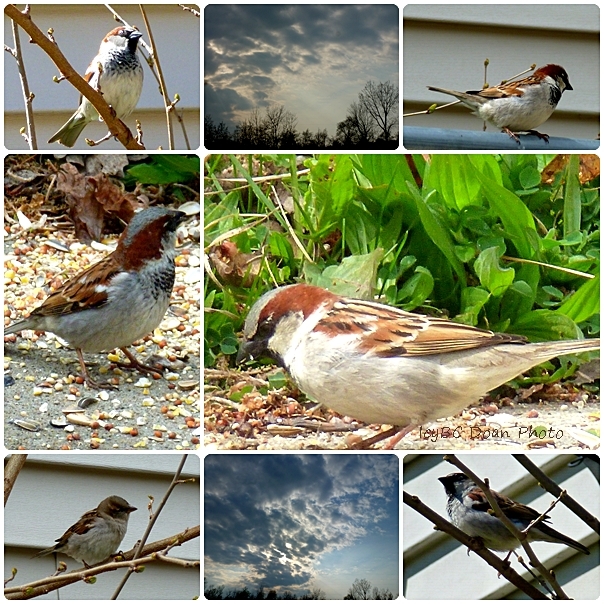 Sweet little sparrows! I think they are highly underappreciated. Happy you featured them today!